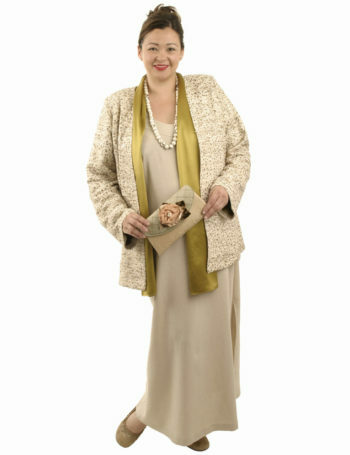 Mother of Bride Jacket Dress Natural Raw Silk Burnished Gold Sequins Sizes 14 - 32: Cream raw silk weave with natural-toned slubs is embellished all over with hand-applied, burnished gold flat paillettes interspersed with translucent green paillettes. 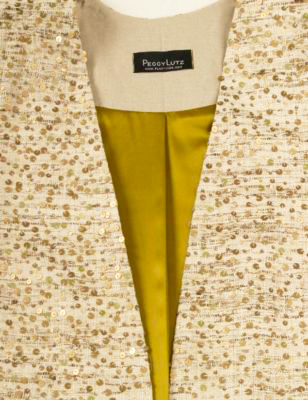 This fine fabric is then lined with chartreusey olive to gold, hand-dyed silk charmeuse. The easy fit and styling make this a casual/dressy Gabi Jacket that dresses up easily and then becomes that special jacket you always reach for because it's so comfortable, so chic and uniquely you. Price quoted is for the jacket, so we'll custom make a dress or separates for you or your can wear it over something from your wardrobe. Seeking a chic wedding or special occasion look? 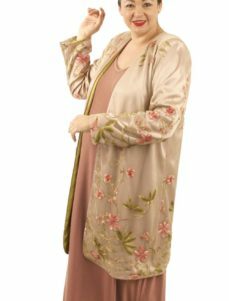 Slip this Gabi Jacket on over a simple dress or separates and have a blast on The Day. You're dressed up but not trying too hard. For the best fit: We find that a generous, flexible fitting garment and a good, local alterations person are invaluable! Plus-size bodies vary so much. Enjoy a relaxed, comfy elegance that lets you be you all the time. Consult with us for any questions and to order a simple Custom Dress or Separates for a spring/summer plus size mother of the bride dress or wedding dress that's perfect for YOU. Enjoy our Very Personal Service! 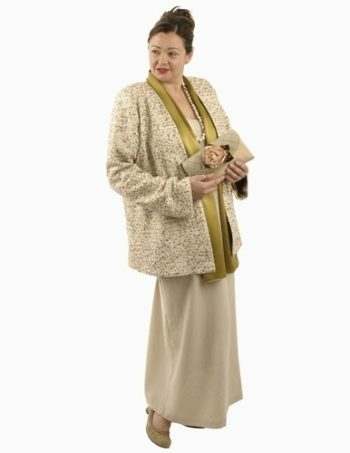 All of our garments are easy to alter as they are created from simple styles I developed over my 35 year career as a plus size couturier, working directly with clients of all shapes and sizes. Perfect for all figure types; we developed our own digital pattern system that's adjustable to everyone. Be the first to review “Mother of Bride Jacket Dress Natural Raw Silk Burnished Gold Sequins Sizes 14 – 32” Click here to cancel reply.